floatingsheep: Baptists, bibliophiles, and bibles, Oh My! Baptists, bibliophiles, and bibles, Oh My! Two powerful and often opposing forces within society are faith and reason. Regardless of the extent to which a cultural war exists, the balance between the two (e.g., teaching evolution in the schools, etc.) is a prominent feature of popular socio-political discourse in the United States. Thus, the topics makes a perfect subject of a map and leads us to ask which parts of the country prefer bookstores to bibles? What's the ratio of Baptists to bibliophiles? Using the number of Google Maps directory listings for "bookstores" and "churches" as proxy values, this visualization maps the spectrum of the faith and reason conflict. As there are an overwhelmingly larger number of churches than bookstores nationwide it is important to index each of these variables before comparison. The technique used in this map was to divide the number of churches (or bookstores) at a location by the national average of churches or bookstores. If a location had twice the number of churches as the national average it would receive an indexed value of 2. Similarly having only 50 percent of the national average of bookstores would produce an indexed value of 0.5. The church index was then divided by the bookstore index to see each locations relative balance of churches to bookstores. If each of the indexed values were the same, the faith-reason index would be equal to 1. But as in the case of the example above (church index = 2, bookstore index = 0.5) the faith-reason index would be 4. This indicates that this particular location has a much higher relative number of churches to bookstores. In order to exclude places that had approximately equal number of churches and bookstores, this map only includes locations where the faith-reason index was skewed more than 20 percent in either direction (i.e., values greater than 1.2). For the most part, the relative prevalence of bookstores occurs in and around the big cities - Los Angeles, California is the site of the highest indexed value, and is joined by the megalopolis of the eastern seaboard as having the highest concentrations in favor of bookstores. Even cities such as Atlanta, nestled in the Bible Belt of the American southeast, tend towards a relatively large number of bookstores. On the converse, other large cities like Dallas, San Antonio and Houston continue to favor churches, with New Orleans (the largest city in Louisiana) having the highest relative concentration of churches in the nation. Suburban areas surrounding large population centers also show a near-universal favoritism for churches. 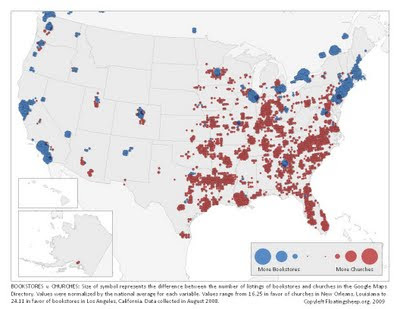 So while there appears to be no single variable determining the local trends toward faith or reason, it is evident that even some of the most common assumptions regarding the geographies of faith and reason have proven to be more complicated; not all large cities are necessarily bookish, but neither is the bible belt a homogeneous geographic unit. Wait a moment; It may well be that some of those bookshops sell only bibles, Christian fiction, and Creationist texts intended to support home schooling! I'm sure some evangelical churches must have their own bookshops, thus cancelling themselves out for the purposes of this study. S/He is... S/He had an *original* idea. I do not find the Bible distorted I find religion distorted, great blog congrats on being a "blog of note" Whats your secret? That is an interesting map! but I find it hard to believe that no one in Montana North or South Dakota never go to a bookstore or buy a bible... Why is there no red or blue in some parts of the USA? Great question! The values in this map were normalized by the average values across the country for each variable, with values below the averages excluded. So this map doesn't show whether or not there are churches or bookstores, per se, but whether or not there is a larger-than-average number of churches or bookstores relative to one another at any given point. I wonder if L.A.'s high number also has something to do with it being the most religiously diverse city. There are still a number of churches, but there are also a lot of temples (Jewish, Hare Krishna, Sikh, etc.) and mosques -- not to mention Scientology centers. Is it just coincidence that red and blue (as in "red states" and "blue states") are the colors of choice for these data sets? I just started a blog about Scandinavian - American differences. This data is awesome for the USA. It also shows where I feel comfortable and where I do not feel comfortable. I am from San Francisco and just got back from visiting North Carolina. I actually saw billboards wanting to know if "I got Jesus". I found it intrusive and repulsive and almost violent as a Lutheran. Doing the same study however in Denmark would not work. Every little village has a church that is used for baptisms, marriages, confirmations and burials. And VERY few people actually "go to church". The country supports the churches financially as an actual Dept of the State. Until recently, only the LUTHERAN churches recorded the above events, even if you were Muslim and spoke Farsi. You registered your child's birth in the local Lutheran Parish. A lot of churches in cities are used for concerts and community events and art exhibits frequently. And they are just beautiful. Not like the plain Puritanical ones in America. Final thought, We talk about dividing California into No and So. Maybe we should divide the USA into East and West.I studied theology for years but I know this graph is really talking about "Bible Belt" where no one would even know what the "Smalcald Articles" are or the date Martin Luther posted the 95 theses on the Door at Wittenberg. Or even the country it happened in. When people ask me if "I got Jesus" I ask them if they are talking about "Yeshua ben Joseph", his real name. Thanks for the blog. Data is not everything but it sure is very useful. Very. Postscript to my post: I support BOTH faith and reason but no extremism. To be of value both need to honor inclusiveness and not actively assist exclusiveness. Denmark highly values inclusiveness. It may have a state church but it has freedom of religion and when people do not fit in they think it is the fault of society. They have the largest mosque outside a Muslim country. America is very exclusive in its values. When people do not fit in most people think it is their fault and society is just fine. Totally opposite. We have a very ex-clusive view of freedom in USA. I think it must look like English paternalism. A major problem here is that this sets up a false dichotomy. Christianity is not "unreasonable" nor is faith a necessary denial of reason. It may be that the most reasonable people in America are church goers. The existence of churches does not exclude reason. The second big problem here is that "bookstores" are not necessarily bastions of reason, and certainly not of reason over faith. It has been pointed out that many bookstores also sell Bibles and religious books, some of them exclusively so. In addition bookstores also sell fiction, including romance novels, children's stories, and picture books (Coffeetable books) as well. The mere presence of "Bookstores" says nothing about a region's committment to reason over unreason or fanaticism, or sensuality, or greed or any other life committment, positive or negative. This study is analogous to trying to determine how stable families are in a region by counting the number of lawnmowers. Gee, you have access to Google so then is it reasonable to assume you also have access to Yahoo... so perhaps you hate Yahoo since you choose Google to draw a comparison of some data to draw a conclusion. Your faith in Google seems strong... why is that..? To paraphrase Fred; Faith and reason are not mutually exclusive. to Nina, I would suggest.. choose Denmark as your home. Also another comment. More churches is often a result of more religious diversity. If you have an area where almost everybody is Catholic there will be mostly a small number of Catholic churches that are each used by a large number of people. In an area that is mainly Baptist/Pentecostal/Non-denominational (such as the south) you will see a lot of churches because the churches are generally smaller and cater to a smaller group. As a Baptist AND bibliophile. Let me assure you faith and reason are only opposed on a broad philosophical definition. My specific variation on Baptist faith (part of a diverse variety) is that we are to apply reason to faith. "Work out your salvation with fear and trembling." refers not to working for salvation but working to understand salvation. Okay, now that I'm getting off my soap-box you can go back to your interesting mapping. The problem I see with this map is the way it fails to take into account the size of churches. Catholic churches are fewer and farther between, but generally have much larger congregations. My community has 1 Catholic church, and numerous Protestant churches/ nondenominational "storefront" churches. The Catholic church may have as many as 1000, parishioners, while the smaller churches are lucky to have 50 congregants. For this reason, simply measuring the number of church listings is no way to accurately measure the number of society's faithful. I know it is much more difficult, but an accurate snapshot requires legwork, measuring the number of regular churchgoers in a community, as well as those who visit secular bookstores frequently. "But the aim of our instruction is love that comes from a pure heart, a good conscience, and a sincere faith. Some have strayed from these and turned away to empty discussion." Note to sincere seekers:God loves you. And salvation is a reasonable offer, and faith makes sense. Why not faith? Embryos and fetuses can have faith. Disaster victims can choose faith, a moment before that last glimpse of life vanishes...it puts us all on the same level... God is fair and just and loving. There are no "deserving ones" who earn heaven on their own, nor any "innocent ones" who fall into condemnation by mistake.